The president suffered a double blow in recent months. The loss of the House of Representatives undermined his reputation as Teflon Don. The significance of increasing the Republican margin in the Senate and maintaining control of key governorships in Florida, Ohio, and Iowa faded after Election Day, as Democrats picked up House seat after House seat. The damage compounded on December 11 when Trump met with Nancy Pelosi and Chuck Schumer in the Oval Office and preemptively took credit for a government shutdown if Congress, then under Republican control, didn't vote for additional wall funds. When the government shutdown began on December 22, voters knew exactly whom to hold responsible. Trump's job disapproval spiked. I mistakenly thought Trump's leverage would increase as the shutdown dragged on. Instead Pelosi held her caucus together, his numbers continued to fall, and Republican senators began to defect. By the time the FAA halted flights at three important airports in the Northeast, Trump's hand had disappeared. He agreed to reopen the government with no wall money until February 15. Pelosi won this round. But she also made an error: delaying the State of the Union until after the government reopened. Maybe it seemed like a clever move at the time. However, by eventually agreeing to her demand, Trump was allowed to deliver his annual address after the fallout from the shutdown had dissipated. Had he given the speech in the midst of furloughs, the content would have been lost amongst stories of hard-hit public employees. Pelosi inadvertently delivered Trump the blank slate on which he could write the next chapter of his administration. He made the most of the opportunity. The State of the Union was Trump at his best: commanding, funny, bold, patriotic, and direct. His interactions with both the Congress and with the first lady's invited guests showcased his talents as a television host. He emphasized his chief political asset: the remarkable state of the American economy. He noted the bipartisan achievements of the previous Congress. And he once again put himself in the center of American politics, where you find support for border security, reciprocal trade practices, diplomacy over intervention, and restrictions on late-term abortion. Critics say the speech was a mish-mash. What they neglect is that it undertook several projects at once: recapping the accomplishments of the last two years, humanizing Trump by having him tell the stories of audience members, reminding us of the best of America, and laying out the themes for the next two years. This wasn't just a state of the union address. It was the launch of Trump 2020. Part of any candidate rollout is defining the opposition. This was a task the president accomplished with his usual aplomb. Where previous Republican candidates and presidents have avoided the burning mansion of America's culture war, Donald Trump rushes in. He is unafraid to hold positions anathema to media figures but commonsensical to most Americans. He portrayed the Democrats as radical on illegal immigration, extreme on abortion, and friendly to socialism. The way the Democrats have been behaving recently, he made a strong case. Democrats have been sleepwalking into 2020. They assume that Trump is done for and whomever they put up will win. They are making a mistake. "He has a kind of feral genius for manipulating the media environment," David Axelrod told the New Yorker recently. "We know there's nothing that he wouldn't do to win, so he will be working day and night to destroy whoever the nominee is, and he's got a great talent for that." A talent that was subtly but effectively evident the other night. Trump has performed well each of the three times he has addressed joint sessions of Congress. It's the other 745 days since inauguration that have sometimes given him trouble. To begin his campaign successfully, then, he will have to emerge unscathed from three upcoming negotiations. The second test is Trump's upcoming summit with Kim Jong-Un. Scheduled for the last days in February in Vietnam, the upshot is far from clear. According to special representative Stephen Biegun, the U.S. offer remains the same: The complete, verifiable, and irreversible denuclearization of North Korea will be followed by American sanctions relief and economic investment. North Korea's reply? Drop the sanctions and we'll think about it. The uncertainty is compounded by Trump's reliance on personal diplomacy. We don't know what the two leaders will say to each other, nor what Pompeo, Bolton, and Biegun (not to mention Kim's deputies) will do behind the scenes. Count me skeptical that a miracle will occur. The best outcome is therefore the Kissingerian one: keep the process going without any concessions from either side. The status quo, where North Korea refrains from launching ICBMs, is preferable both to open war and to a deal that exposes our allies in East Asia. Finally, there's China. U.S. tariffs on $200 billion of Chinese imports will rise to 25 percent on March 1 unless the two powers reach an agreement. Steve Mnuchin and Robert Lighthizer are scheduled to visit Beijing next week for another round of talks. China, which has been hit hard by the tariffs Trump has already imposed, seems eager to pledge to increase U.S. imports but reluctant to address the structural issues of intellectual property theft, forced technology transfer, and state-owned enterprises. Trump faces crosscutting pressures: the stock market and agriculture sector hate the trade war, while Senate Democrats tell the president not to buckle. Both the American and Chinese presidents have every incentive to make a deal. But I wouldn't be surprised if Tariff Man walks away. Nor would I presume to know what might happen next. Trump's unpredictability has brought him far, but it also creates an atmosphere of uncertainty and confusion that unsettles markets and allies and a great number of Americans. 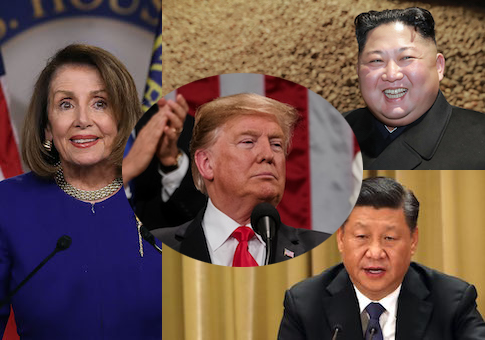 His vital political interest is in maintaining economic expansion and international peace while regaining the support of independents by normalizing his behavior and portraying his opponents as Looney Tunes. That would require him to sometimes take yes for an answer, declare victory, and move on. Which is what I would do in the cases of Congress and China, while keeping the ball rolling and sanctions tight on North Korea. But it's not like he's listened to me before. This entry was posted in Columns and tagged Donald Trump, Kim Jong Un, Nancy Pelosi, Xi Jinping. Bookmark the permalink.